Smart homeowners are aware of a great way to keep their property in tip-top shape. They follow one surprisingly simple bit of advice: get to know your house inside and out. Be sure to check it over regularly, especially the roof. A serious roof leak is not a pretty sight as it can lead to thousands of dollars' worth of damage to your home and its contents. The ideal time to look for potential danger signals is in spring or summer, before the autumn leaves begin to fall and cover up the clues. So be wise and learn how to inspect the condition of your roof. Perform a routine visual inspection of your roof at least once a year, preferably twice, in late spring and then again in late summer through early fall. In addition, check the roof as soon as possible after extreme weather -- severe rainfall, strong winds, or a heavy snow or ice storm -- to see how it has survived. An emergency inspection is called for when you notice a leak, dampness, mildew, or a musty smell anywhere in the house that has no other obvious source. You may also want to check your roof more frequently when your roofing material is coming close to the end of its warranty period. Roof surface -- look for missing, cracked, warped, loose, or rotten shingles or tiles (depending on what your roof is made of), moss or mold, standing water, and debris that will need to be removed. Flashing -- watch out for rust, cracks, or dents in the flashing (the metal pieces which cover the chimney area, dormers, and vent pipes). Faulty flashing will let in rain and snow, resulting in rot unless the problem is taken care of promptly. Roof overhangs -- stay on the alert for peeling paint found on the underside of roof overhangs. This is a warning indicator of moisture. Gutters -- make sure that the gutters are clear of leaves, dirt, and dislodged roof tiles or masses of colored granules from aging asphalt shingles. The latter is a distinct sign that your roof will need repair pronto. Underside of the roof -- from the attic, check for sagging ceilings, leaks, and holes. A good clue that there may be some serious trouble is sunshine visible through gaps in the roof. Note the exact spots (taking a photo is the simplest way) so that you will have a clear guide when you bring in a roofer to fix the problem. Use good quality binoculars to check your roof out from the ground, if you can manage to get an unobstructed view from there. Otherwise, climb up on a sturdy extension ladder; make sure that it is steady, placed on solid level ground, not in front of a door, and extended at least 3 feet above the roof edge. Using a fiberglass ladder, rather than an aluminum one, will help safeguard you against electrocution from nearby power lines. (Even wood can conduct electricity if it becomes damp.) Work with a buddy on the ground, if at all possible, or at least let someone know you will be climbing up to the roof. Wear rubber-soled shoes or sneakers with good treads to give you traction and never walk on a tiled roof. 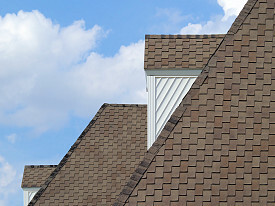 The safest course of action is to call in a knowledgeable, licensed roofing contractor for an in-depth inspection.